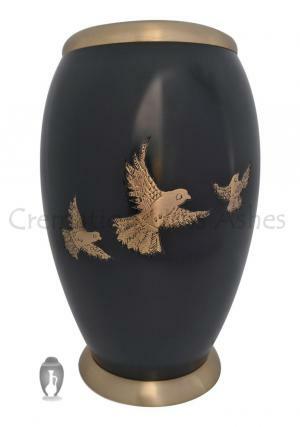 » Size (Inches): 6.5" X 6.5" X 9.84"
The large dove sculptured human ashes urn is an adult urn made of high quality brass metal with hand engraved flying doves in brushed golden brass finish and simple design in complete black enamel brushed well in smooth glossy finish. 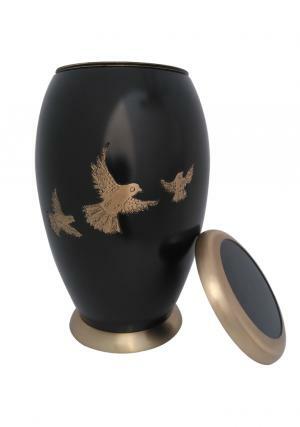 The large adult 3 flying golden doves black urn is hand designed with a flat bottom top lid decorated in brass engraving and screw threading label to secure the ashes of the loved ones, ones in for a long time as memories of the demised love. 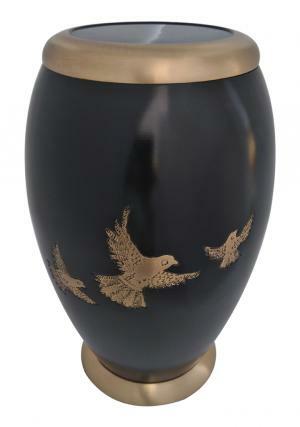 The ashes adult human urn is a large cremation urn measured to dimensions as 9.84 inch tall, 6.5 inch length and width. 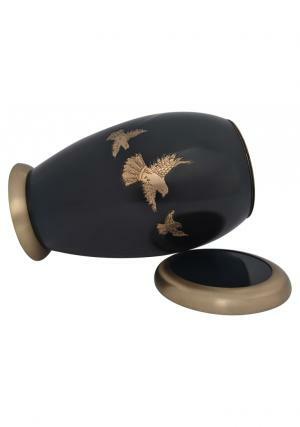 The measured weight of an empty 3 flying golden doves black adult urn is 2.26 Kg and carries approximately 200 cubic inch of human cremated ashes.